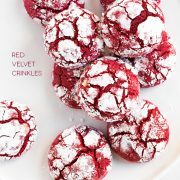 Peppermint Red Velvet Cookies – a perfect holiday treat with it’s beautiful red color and festive peppermint flavor. So when was it that peppermint became associated with the color red? Especially considering it comes from green leaves. Not sure who came up with the color choice but for some reason it’s as if it were meant to be. If you ask me, the flavors of peppermint should most definitely be associated with the color red. 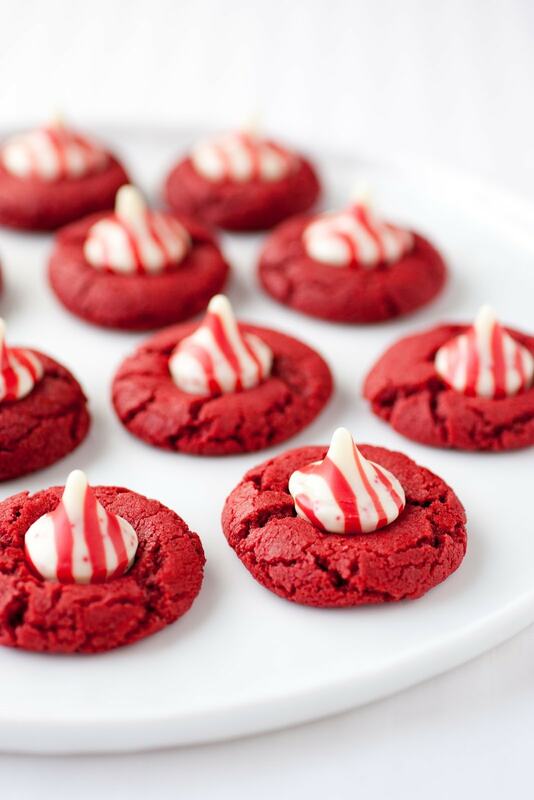 They are vibrant, warm and bold just like the color red, and the obvious answer – the peppermint flavor always reminds me of the Christmas season. This got me thinking that their should be a peppermint red velvet dessert. 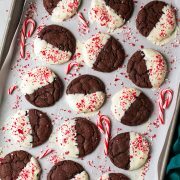 I saw these cookies on Pinterest (yes another Pinterest find, I’m an addict) and decided to make them in a peppermint version with a slightly more vibrant red for the holidays. I simply reduced the cocoa powdered (and replaced the cocoa powder reduction with flour, hence the + 2 tbsp flour) and replaced the brown sugar with granulated sugar to reduce the brown hues in the cookie and I actually used 1 less tsp of the red food coloring because I didn’t think it needed a full tbsp. I also didn’t think the cookies needed a full 12 minutes of baking, my first batch was so dry after baking for 12 minutes so the second I cut clear back to 8 and they were perfect. Moist and chewy on the inside and lightly crisp on the outside. Enjoy! 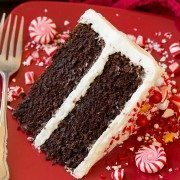 A perfect holiday treat with it's beautiful red color and festive peppermint flavor. Preheat oven to 375 degrees. In a mixing bowl, whisk together flour, cocoa powder, baking soda and salt, set aside. In the bowl of an electric stand mixer fitted with the paddle attachment, blend together vegetable oil and sugar on medium speed until mixture is creamy, about 3 minutes. Mix in egg. Add in food coloring, vinegar, vanilla extract and peppermint extract and mix until well blended. With mixer set on low speed, slowly add in dry ingredients and mix just until combine. Roll dough into balls about 1 scant Tbsp each and place on Silpat or parchment paper lined baking sheets. Bake in preheated oven about 8 - 9 minutes. Remove from oven and allow to cool 30 seconds then lightly press 1 chocolate Kiss onto each cookie and immediately transfer cookies to a wire rack to cool. 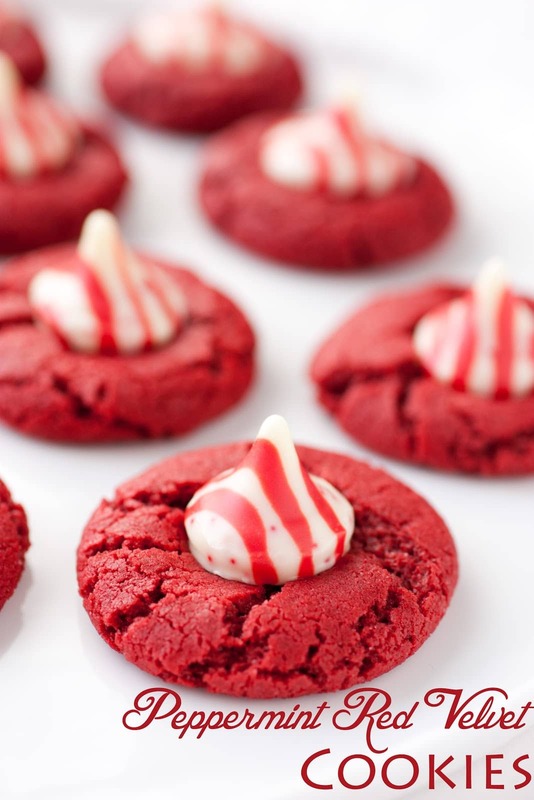 Allow Kisses on cookies to set at room temperature (or transfer to an airtight container and refrigerate until chocolate has set then return to room temperature before enjoying or enjoy warm out of the oven and slightly melted). Store cookies in an airtight container at room temperature. *Place in freezer for at least 30 minutes and don't remove from freezer until removing cookies from oven. If using Hugs or Milk Chocolate Kisses I would recommend increasing peppermint extract to a full 1 tsp. Vanessa: Oooh this looks amaazing!